Chances are you have a shocking childhood memory of seeing a relative’s dentures sitting in a cup of water on the counter for the first time. Or maybe you saw them fall out during Thanksgiving dinner, or worse, maybe that relative took them out on purpose to scare the little kids running around! Whatever the case is, I’m sure you have encountered someone with dentures in your lifetime. Over the years maybe you or a loved one has even become the person wearing dentures. Well just because you are missing a number of teeth it doesn’t mean you are stuck with old floppy teeth that won’t stay in or don’t look very good even when they do. You have a number of options. Dentures don’t have to carry the social stigma they once did. 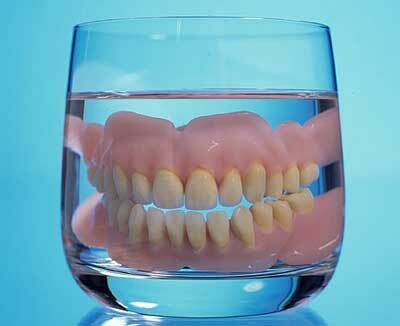 Modern denture wearers should be able to eat and smile without worry. First, let’s talk about partial dentures. These are for people who are missing some, but not all teeth in an arch. If you have at least two teeth remaining, preferably one on each side, a partial may be the best option for you. A partial will utilize your remaining teeth to help hold the denture in place. It does this by clasping onto them for stability. Over the years the styles of clasps have evolved. Partial wearers are no longer stuck with a big metal hook wrapping around the tooth. Actually, in some cases, they aren’t stuck with any metal at all. A flexible partial contains no metal and conforms to your bite and comfort. The soft material allows it to be easily placed in or removed from the mouth, while using flexible, gum colored clasps to hold tight once it is in place. For those patients who prefer the rigidity of a metal framework but do not want any metal clasps visible when they smile, a combination of the two styles of partials can be fabricated with a metal base but flexible, gum colored tooth clasps disguising themselves where they would show. Only a dentist could tell you were wearing a partial. Maybe it’s too late to save those teeth, or maybe you’ve been without teeth for quite some time. Then a complete denture is the answer for you. 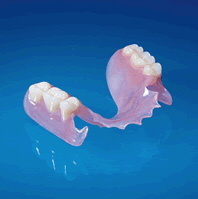 Complete dentures sit on the ridge where your teeth used to be, and replace all the teeth in an arch. The upper denture also utilizes the palate area for stability. In many cases it can be compared to a suction cup, keeping those teeth in place is as easy as wetting the denture and placing it in and biting down, creating a seal. The lower complete denture is a little more complicated. The presence of the tongue not only necessitates a U – shape for the denture, it also works against its stability by continually knocking it loose. The thicker or taller your ridge is, the less of a stability problem you will have. But without teeth, as you age, that ridge slowly recedes away. 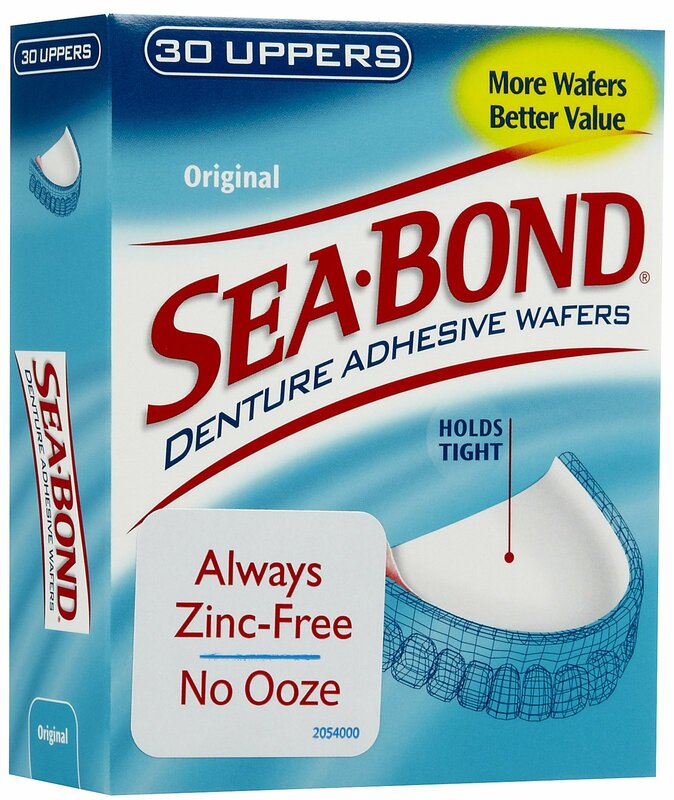 This means patients with a complete lower denture may have to use denture adhesive to keep the lower in place. These come in various forms- a traditional paste, an easy to clean up powder, and the newer adhesive strips. These aren’t a perfect solution. So for patients who want even more stability they have the option of an implant overdenture, or an All-on-4 denture. 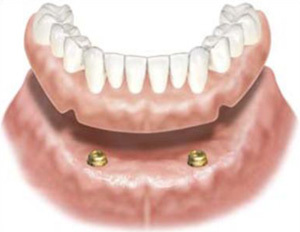 The implant overdenture utilizes 2 implants placed toward the front of the lower ridge. Snap-in attachments are then used inside the denture to hold it firmly in place. The patient would still treat it like a normal denture; taking it out at night for cleaning. An All-on-4 denture uses 4 to 6 implants placed around the ridge to permanently hold a denture in place. Because implants take all the pressure and chewing forces in this case, it is by far the most comfortable option. It is also permanently in place and can only be removed by your dentist. The bottom line is, whether you’re missing a few teeth, or all of them, there is a denture solution you will be happy with. Even if you still want to take them out to scare the grandkids. We look forward to meeting with you and discussing your denture or partial options. Also, if you are a good candidate for All-on-4 or implant overdenture, you can learn more about what to expect from the process and your final results of treatment. Contact us to schedule an appointment. previousI Can't Have a Cavity, I Don't Eat Candy!